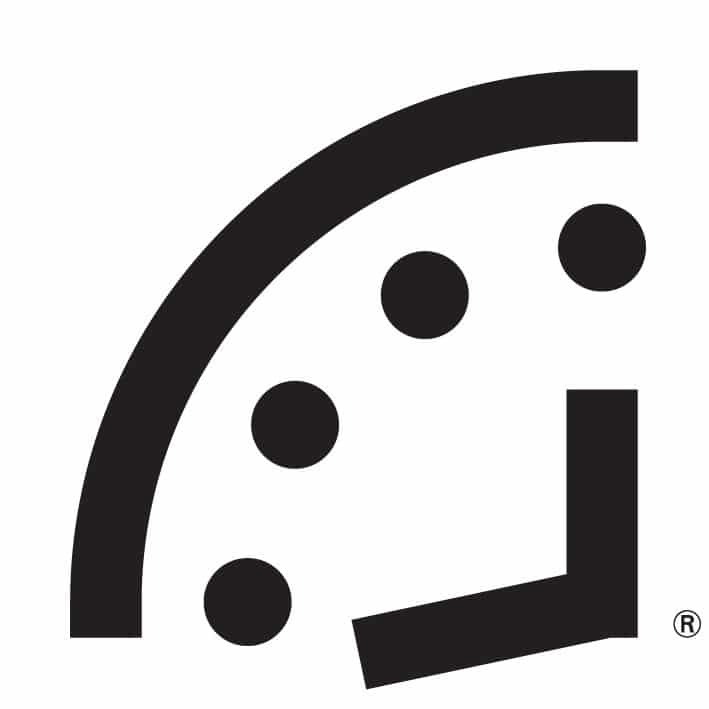 "Last year, the Science and Security Board moved the Doomsday Clock forward to three minutes to midnight, noting: 'The probability of global catastrophe is very high, and the actions needed to reduce the risks of disaster must be taken very soon.' That probability has not been reduced. The Clock ticks. Global danger looms. Wise leaders should act—immediately." 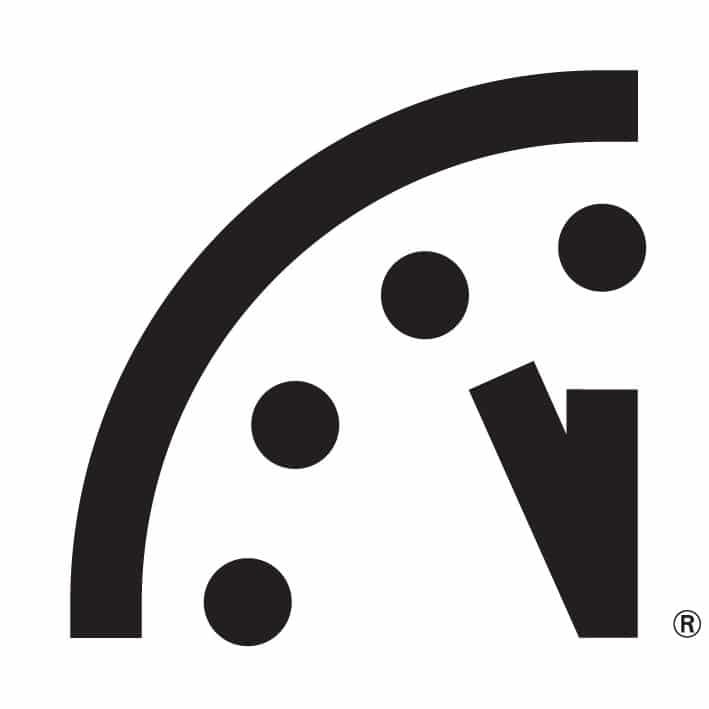 See the full statement from the Science and Security Board on the 2016 time of the Doomsday Clock. 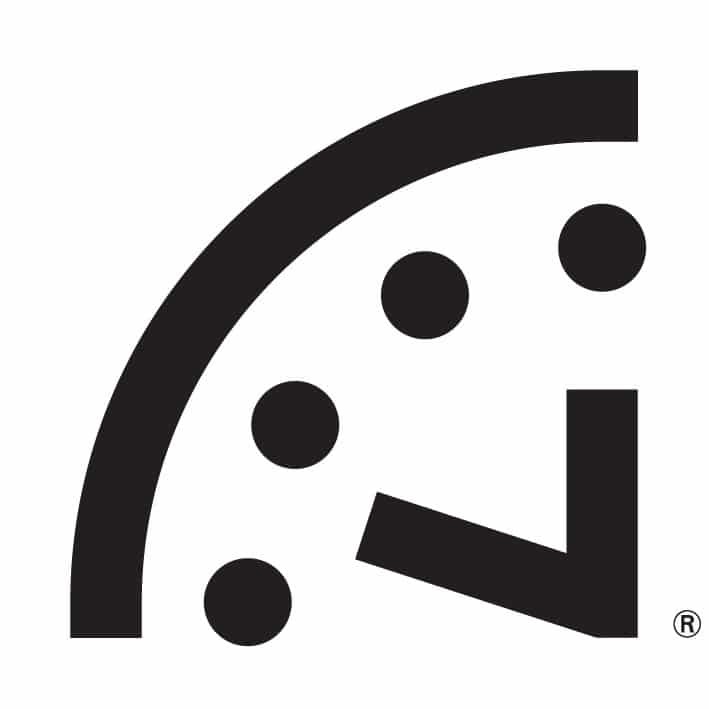 "Unchecked climate change, global nuclear weapons modernizations, and outsized nuclear weapons arsenals pose extraordinary and undeniable threats to the continued existence of humanity, and world leaders have failed to act with the speed or on the scale required to protect citizens from potential catastrophe. These failures of political leadership endanger every person on Earth." Despite some modestly positive developments in the climate change arena, current efforts are entirely insufficient to prevent a catastrophic warming of Earth. Meanwhile, the United States and Russia have embarked on massive programs to modernize their nuclear triads-thereby undermining existing nuclear weapons treaties. "The clock ticks now at just three minutes to midnight because international leaders are failing to perform their most important duty—ensuring and preserving the health and vitality of human civilization." Read the full statement. "The challenges to rid the world of nuclear weapons, harness nuclear power, and meet the nearly inexorable climate disruptions from global warming are complex and interconnected. In the face of such complex problems, it is difficult to see where the capacity lies to address these challenges." Political processes seem wholly inadequate; the potential for nuclear weapons use in regional conflicts in the Middle East, Northeast Asia, and South Asia are alarming; safer nuclear reactor designs need to be developed and built, and more stringent oversight, training, and attention are needed to prevent future disasters; the pace of technological solutions to address climate change may not be adequate to meet the hardships that large-scale disruption of the climate portends. Read the full statement. "We are poised to bend the arc of history toward a world free of nuclear weapons" is the Bulletin's assessment. Talks between Washington and Moscow for a follow-on agreement to the Strategic Arms Reduction Treaty are nearly complete, and more negotiations for further reductions in the U.S. and Russian nuclear arsenal are already planned. The dangers posed by climate change are growing, but there are pockets of progress. Most notably, at Copenhagen, the developing and industrialized countries agree to take responsibility for carbon emissions and to limit global temperature rise to 2 degrees Celsius. Read the full statement. The world stands at the brink of a second nuclear age. The United States and Russia remain ready to stage a nuclear attack within minutes, North Korea conducts a nuclear test, and many in the international community worry that Iran plans to acquire the Bomb. Climate change also presents a dire challenge to humanity. Damage to ecosystems is already taking place; flooding, destructive storms, increased drought, and polar ice melt are causing loss of life and property. Read the full statement. Concerns regarding a nuclear terrorist attack underscore the enormous amount of unsecured — and sometimes unaccounted for — weapon-grade nuclear materials located throughout the world. Meanwhile, the United States expresses a desire to design new nuclear weapons, with an emphasis on those able to destroy hardened and deeply buried targets. It also rejects a series of arms control treaties and announces it will withdraw from the Anti-Ballistic Missile Treaty. Read the full statement. India and Pakistan stage nuclear weapons tests only three weeks apart. "The tests are a symptom of the failure of the international community to fully commit itself to control the spread of nuclear weapons — and to work toward substantial reductions in the numbers of these weapons," a dismayed Bulletin reports. Russia and the United States continue to serve as poor examples to the rest of the world. Together, they still maintain 7,000 warheads ready to fire at each other within 15 minutes. Read the full statement. Hopes for a large post-Cold War peace dividend and a renouncing of nuclear weapons fade. Particularly in the United States, hard-liners seem reluctant to soften their rhetoric or actions, as they claim that a resurgent Russia could provide as much of a threat as the Soviet Union. Such talk slows the rollback in global nuclear forces; more than 40,000 nuclear weapons remain worldwide. There is also concern that terrorists could exploit poorly secured nuclear facilities in the former Soviet Union. Read the full statement. With the Cold War officially over, the United States and Russia begin making deep cuts to their nuclear arsenals. The Strategic Arms Reduction Treaty greatly reduces the number of strategic nuclear weapons deployed by the two former adversaries. Better still, a series of unilateral initiatives remove most of the intercontinental ballistic missiles and bombers in both countries from hair-trigger alert. "The illusion that tens of thousands of nuclear weapons are a guarantor of national security has been stripped away," the Bulletin declares. Read the full statement. The United States and Soviet Union sign the historic Intermediate-Range Nuclear Forces Treaty, the first agreement to actually ban a whole category of nuclear weapons. The leadership shown by President Ronald Reagan and Soviet Premier Mikhail Gorbachev makes the treaty a reality, but public opposition to U.S. nuclear weapons in Western Europe inspires it. For years, such intermediate-range missiles had kept Western Europe in the crosshairs of the two superpowers. Read the full statement. U.S.-Soviet relations reach their iciest point in decades. Dialogue between the two superpowers virtually stops. "Every channel of communications has been constricted or shut down; every form of contact has been attenuated or cut off. And arms control negotiations have been reduced to a species of propaganda," a concerned Bulletin informs readers. The United States seems to flout the few arms control agreements in place by seeking an expansive, space-based anti-ballistic missile capability, raising worries that a new arms race will begin. Read the full statement. The Soviet invasion of Afghanistan hardens the U.S. nuclear posture. Before he leaves office, President Jimmy Carter pulls the United States from the Olympic Games in Moscow and considers ways in which the United States could win a nuclear war. The rhetoric only intensifies with the election of Ronald Reagan as president. Reagan scraps any talk of arms control and proposes that the best way to end the Cold War is for the United States to win it. Read the full statement. Thirty-five years after the start of the nuclear age and after some promising disarmament gains, the United States and the Soviet Union still view nuclear weapons as an integral component of their national security. This stalled progress discourages the Bulletin: "[The Soviet Union and United States have] been behaving like what may best be described as 'nucleoholics' — drunks who continue to insist that the drink being consumed is positively 'the last one,' but who can always find a good excuse for 'just one more round.'" Read the full statement. South Asia gets the Bomb, as India tests its first nuclear device. And any gains in previous arms control agreements seem like a mirage. The United States and Soviet Union appear to be modernizing their nuclear forces, not reducing them. Thanks to the deployment of multiple independently targetable reentry vehicles (MIRV), both countries can now load their intercontinental ballistic missiles with more nuclear warheads than before. Read the full statement. The United States and Soviet Union attempt to curb the race for nuclear superiority by signing the Strategic Arms Limitation Treaty (SALT) and the Anti-Ballistic Missile (ABM) Treaty. The two treaties force a nuclear parity of sorts. SALT limits the number of ballistic missile launchers either country can possess, and the ABM Treaty stops an arms race in defensive weaponry from developing. Read the full statement. Nearly all of the world's nations come together to sign the Nuclear Non-Proliferation Treaty. The deal is simple — the nuclear weapon states vow to help the treaty's non-nuclear weapon signatories develop nuclear power if they promise to forego producing nuclear weapons. The nuclear weapon states also pledge to abolish their own arsenals when political conditions allow for it. Although Israel, India, and Pakistan refuse to sign the treaty, the Bulletin is cautiously optimistic: "The great powers have made the first step. They must proceed without delay to the next one — the dismantling, gradually, of their own oversized military establishments." Read the full statement. Regional wars rage. U.S. involvement in Vietnam intensifies, India and Pakistan battle in 1965, and Israel and its Arab neighbors renew hostilities in 1967. Worse yet, France and China develop nuclear weapons to assert themselves as global players. "There is little reason to feel sanguine about the future of our society on the world scale," the Bulletin laments. "There is a mass revulsion against war, yes; but no sign of conscious intellectual leadership in a rebellion against the deadly heritage of international anarchy." Read the full statement. After a decade of almost non-stop nuclear tests, the United States and Soviet Union sign the Partial Test Ban Treaty, which ends all atmospheric nuclear testing. While it does not outlaw underground testing, the treaty represents progress in at least slowing the arms race. It also signals awareness among the Soviets and United States that they need to work together to prevent nuclear annihilation. Read the full statement. Political actions belie the tough talk of "massive retaliation." For the first time, the United States and Soviet Union appear eager to avoid direct confrontation in regional conflicts such as the 1956 Egyptian-Israeli dispute. Joint projects that build trust and constructive dialogue between third parties also quell diplomatic hostilities. Scientists initiate many of these measures, helping establish the International Geophysical Year, a series of coordinated, worldwide scientific observations, and the Pugwash Conferences, which allow Soviet and American scientists to interact. Read the full statement. After much debate, the United States decides to pursue the hydrogen bomb, a weapon far more powerful than any atomic bomb. In October 1952, the United States tests its first thermonuclear device, obliterating a Pacific Ocean islet in the process; nine months later, the Soviets test an H-bomb of their own. "The hands of the Clock of Doom have moved again," the Bulletin announces. "Only a few more swings of the pendulum, and, from Moscow to Chicago, atomic explosions will strike midnight for Western civilization." Read the full statement. The Soviet Union denies it, but in the fall, President Harry Truman tells the American public that the Soviets tested their first nuclear device, officially starting the arms race. "We do not advise Americans that doomsday is near and that they can expect atomic bombs to start falling on their heads a month or year from now," the Bulletin explains. 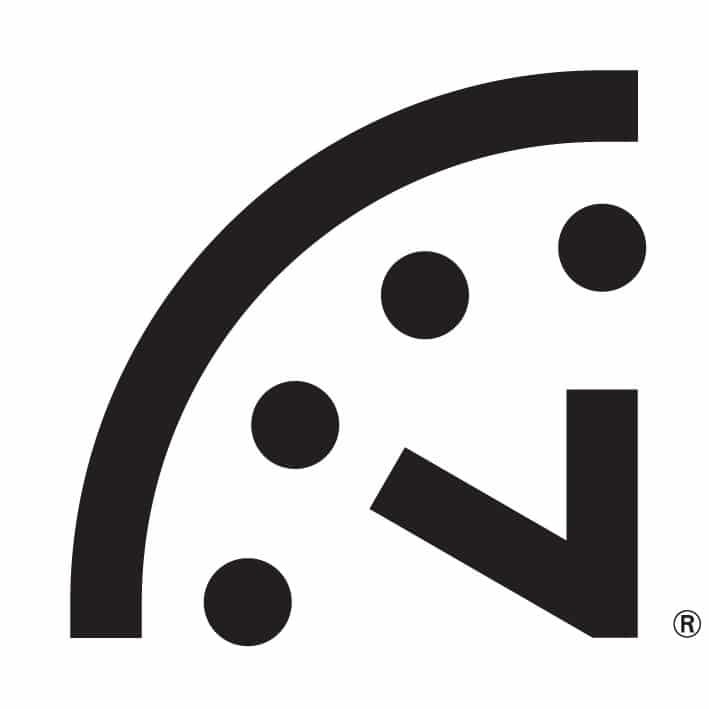 "But we think they have reason to be deeply alarmed and to be prepared for grave decisions." Read the full statement. 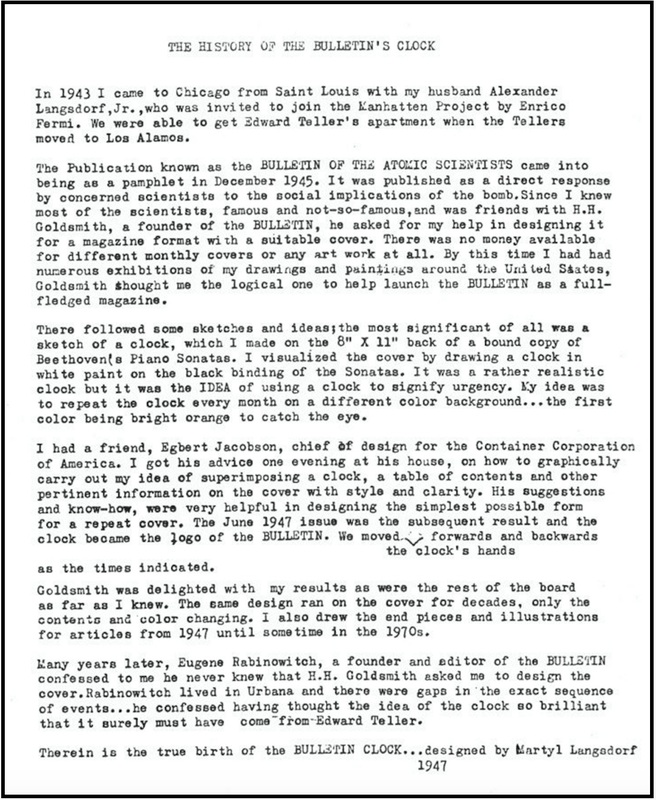 As the Bulletin evolves from a newsletter into a magazine, the Clock appears on the cover for the first time. It symbolizes the urgency of the nuclear dangers that the magazine's founders — and the broader scientific community — are trying to convey to the public and political leaders around the world. Read about Martyl Langsdorf, the creator of the Doomsday Clock, and read her note about how and why she came up with the design for what graphic designer Michael Beirut calls "the most powerful piece of information design of the 20th Century."